Born: 1937 Jun 27 in Crawfordsville, Indiana, USA. Qualifications: (1959) BA in maths/physics; (1961) MS in physics; (1965) PhD in physics from Yale University. NASA career: (1967 Aug 4) selected as a NASA scientist-astronaut, Group 6; (1967— 1969) astronaut academic, simulator, survival and jet pilot training programme. Worked on early Skylab development issues; (1971) support crew member and Capcom, Apollo 15; (1972) Capcom Apollo 17; (from 1973) Shuttle development issues. Worked on early studies for Spacelab simulations. 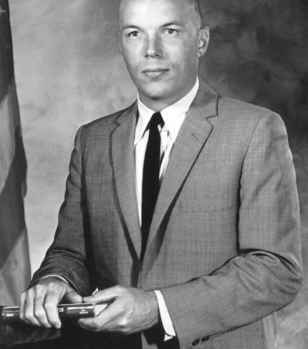 Early candidate for assignment to Spacelab 1; (1974—1975) participated in NASA's Outlook for Space study; (1975—1978) Assistant Administrator for Legislative Affairs, NASA HQ, Washington; (1978) returned to JSC as a senior scientist-astronaut; (1980—1981) Technical Assistant to Director of Flight Crew Operations, JSC; (1981) support crew and Capcom, STS-1; (1982 Nov 11—16) flew as MS STS-5 (122 hours), the first operational Shuttle mission. Planned demonstration EVA cancelled; (1983) CB support for STS-8, and 41-B; (1984 Nov 8—14) flew as MS STS 51-A (191 hours) satellite deployment and retrieval mission. Completed two EVAs totalling 11 hours 42 minutes, including a 2 hr 22 min flight on an MMU (Unit 3); (1985 Jul 1) resigned from NASA to join Space Industries Inc.
Allen logged over 313 hours in space on two missions.